Michael Fox, the new General Manager and Site Director, will deliver a quick overview of Lockheed Martin’s Donaldson Center operations to include the start-up of production operations for the F-16 “Viper” fighter jet in Greenville SC and our positioning for the T-50A Advance Pilot Training (ATP) competition. He will share some thoughts on the amazing team in Greenville, the exceptional community support and the additional growth opportunities for Lockheed Martin in Greenville. 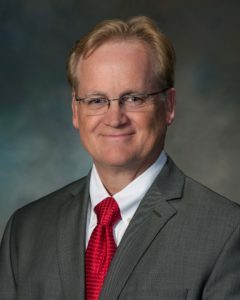 Mr. Fox is responsible for Lockheed Martin’s nearly 500 person operation and facility that comprises 276 acres with 16 hangars, support shops and warehouse space. The Greenville site’s customer base includes the U.S. Navy, U.S. Air Force, U.S. Coast Guard, Homeland Security and multiple International operators. Michael joined Lockheed Martin in 2003 after serving 22 years in the U.S. Air Force, specializing in aircraft maintenance and flight operations. He holds a bachelor’s degree in human resources management from Troy State University and dual master’s degrees in Adult and Higher Education and Human Relations from the University of Oklahoma. He is married to Fay Fox and has four children and four grandchildren.